Last Sunday [June 20, 1999] was the worst Father’s Day I’ve ever had, because my father didn’t live to see it. He was doing fine just last Thursday, when I made one of my customary stops at his dinosaur studio to swap articles and shoot the breeze. We chuckled at how Bill Buckley had been taken in by a hoax involving postal taxes on internet mail. We looked at pop’s latest sculpture, of the pharaoh Akhenaten, and Dad gleamed as he described his plan to use radiant quartz crystals for the eyes. I gave him an article comparing the democratic spirit of ‘Star Trek’ to the feudal dictatorships (both malevolent and benevolent) of ‘Star Wars.’ We talked over a couple of other things, and then I was on my way. Dad called me at work a couple of hours later to say how much he had enjoyed the Star Wars/Star Trek article. That was the last time we talked. I got a call from my mom at about 7 that night. In a shaking voice, she said that there were six people working on dad, and he wasn’t responding. After I made it through 40 minutes of driving rain to the house, and then (following a note’s instructions) to hospital, I learned the worst. Even though the medics were there in just minutes, there was nothing they could do. In the days since then, as Father’s Day approached, I gave some good hard thought to what this day means to me now. And this Father’s Day was, in fact, a really good day for me. Because, on reflection, I can honestly say that my dad is the best dad in the world. The best dad ever. For real. When we (my sister Debbie and I) were kids, dad was the neighborhood story-teller. He would spin one tall tale after another. Many tales involved a reasonable, decent person who was just trying to get along, when some rude alligator (or other villain) would harass him to the point, that he, well, Lost His Temper! These stories enchanted not just my sister and me, but cousins, neighbor kids, and whoever else happened along. 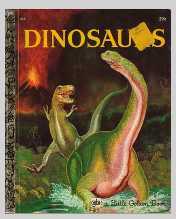 When I was five or six, dad got me a 25-cent Golden Book on dinosaurs. “These dinosaurs are really neat,” I said. “Let’s go find some,” he said. 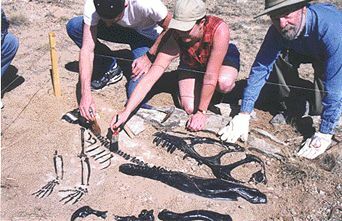 And so he got some tips from his geologist friends, and, in a few months, learned to be an expert paleontologist. And kids - cousins, friends, etc. - were always invited along on the ride. Dave Thomas helped dozens and dozens of kids discover a New Mexico that doesn’t exist in the guide books, a New Mexico dotted with exotic locales named Dinosaur Land, and Happy Hunting Fossil Grounds, and Ammonite Valley, and Shark Tooth Ridge. And a ride with Dave up to Jemez Springs was like a 100-million-year-long trip in a time machine, as he pointed out the Permian here, Triassic there, Jurassic over there, and so on. My dad enjoyed dinosaurs so much that he left his career as a construction equipment journalist and became a well-known dinosaur sculptor and scientist. David Arthur Thomas proved that there are still Renaissance Men. He was a journalist. And an artist, and a sculptor. And a scientist, and a careful student of nature. And a writer of popular articles (Scientific American, Skeptical Inquirer) and op-ed pieces and letters. And a classical and jazz violinist, a fiddler, and vibraharp player. And a political volunteer. And a partyer. And a United States Marine. And a killer at Jeopardy, Scrabble, and crosswords. And a story teller and entertainer. And a loving husband, and brother. And what a father, especially for me and Debbie, but also, indirectly, for our friends, relatives, and any other kids who happened to stumble by. And his grandsons - my sons Ben and Matt - enjoyed one of the best grandpas of all time. Some of their friends disbelieved them when they said their grandpa had made the big dinosaurs outside the museum - that is, until grandpa himself went along on a field trip to the museum, and set them all straight. And then there were grandpa’s special tours of all the fossil museums in the Rockies, or the week-long raft trip in Idaho. And through all this, he was always there for me too - playing along with me and my college-era band of brothers at our bluegrass gigs in Jemez Springs, or helping me and my buddies stage elaborate internet April Fools’ pranks. (“Dad? We need a hominid skeleton and an allosaurus skull. Do you have anything?” The answer: “Sure, right over here, right behind the glyptodont…”) He was also there for his daughter-in-law, my wife Pam, doing things like cheerfully driving down to Los Lunas to pick up signs for her school board campaign. And he was always there for Mom. As I was writing this letter, I got a call from a guy who had seen dad later on Thursday afternoon, after I had talked with him. Dad was leaving the Press Club, when a small boy walked up in the drizzling rain, and asked if he knew where there was a bathroom. “Sure,” Dave said, and walked the boy inside to the bathroom, than back to the park. Then he popped into his truck and drove home. An hour or two later, he was gone. He was the world’s best dad, right up to the end. Yeah, everybody says they have the best dad in the world. And that’s good. That’s how it should be. But I think I have a really good case. I really do have the best dad in the world. And boy, did I miss him this Father’s Day. I don’t know if pops is watching from above. But I do know that there is life after death in a very real sense. When a stone is tossed into a pond, the ripples from the splash reverberate long, long after after the stone has settled quietly on the bottom. And life is like that too. 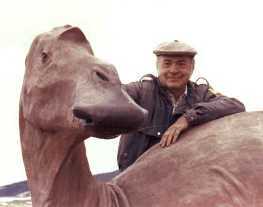 Every time a kid looks at one of Dad’s dinosaurs and says “Wow!”, a little bit of David A. Thomas will still be alive.